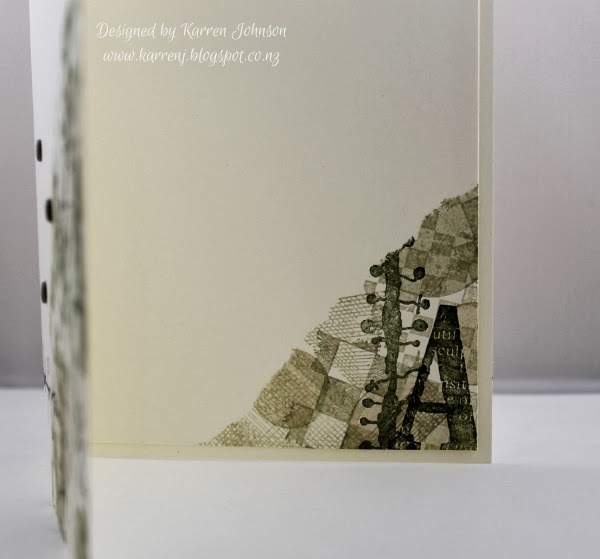 The challenge is to find a designer that you like and case one of their cards. 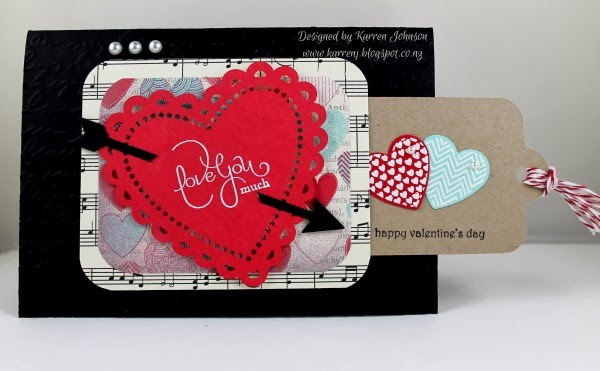 I chose Jen Mitchell, whose stamping style I really admire. 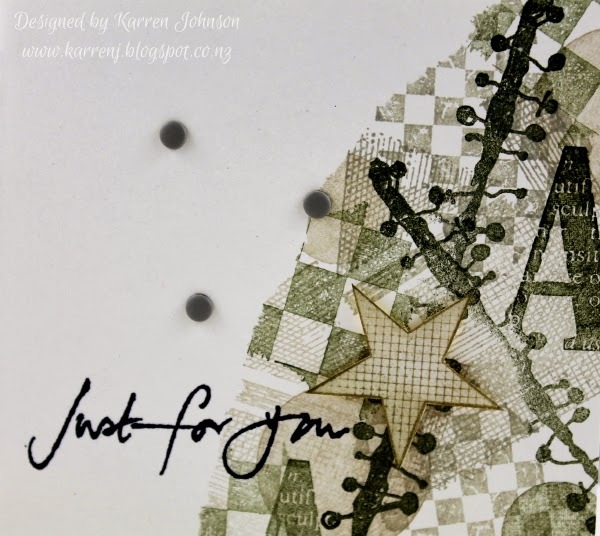 Finding a card to case involved a pleasant visit to her blog, where I found this card from November last year. 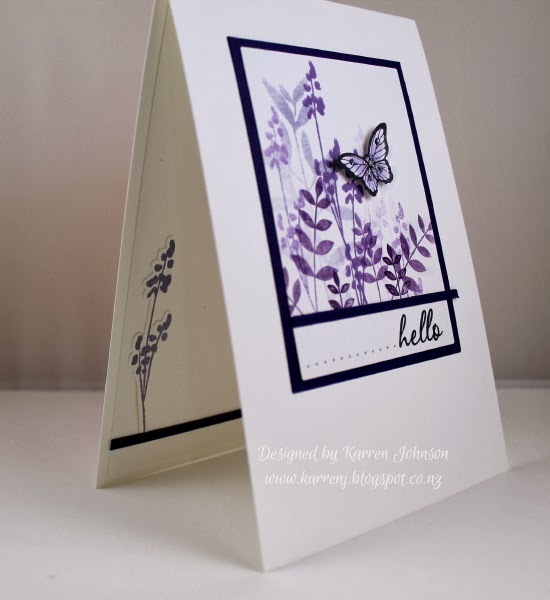 This is a one-layer card and uses many stamps from Stampers Anonymous and Hampton Art Stamps. 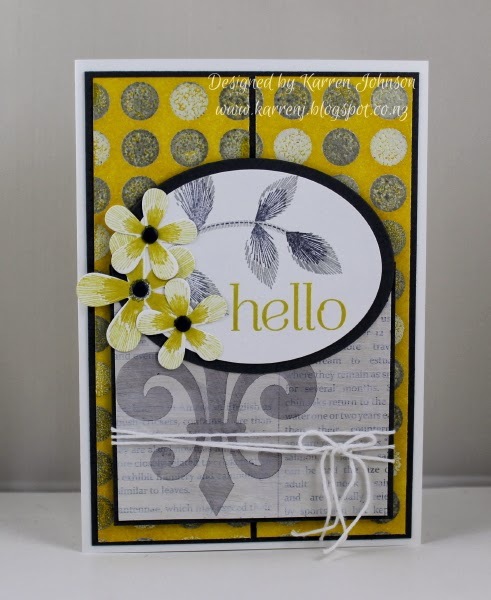 I masked off an area of my card base and randomly stamped images using Always Artichoke, Sahara Sand and Crumb Cake ink. 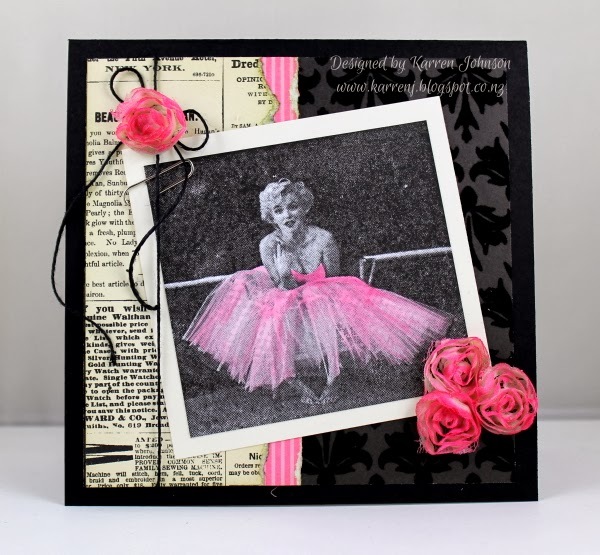 The sentiment is a Penny Black stamp and was stamped in Memento Tuxedo Black ink. Thanks for looking. Go check out the new challenge. It looks like it's going to be fun. 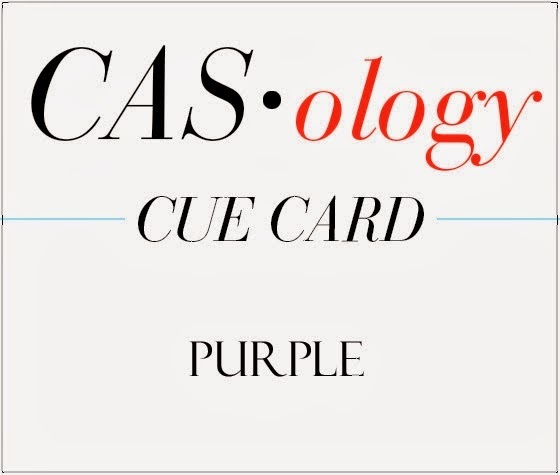 For my second card today, I've combined challenges from CAS(E) This Sketch, CASology and Colour Me to come up with this card. 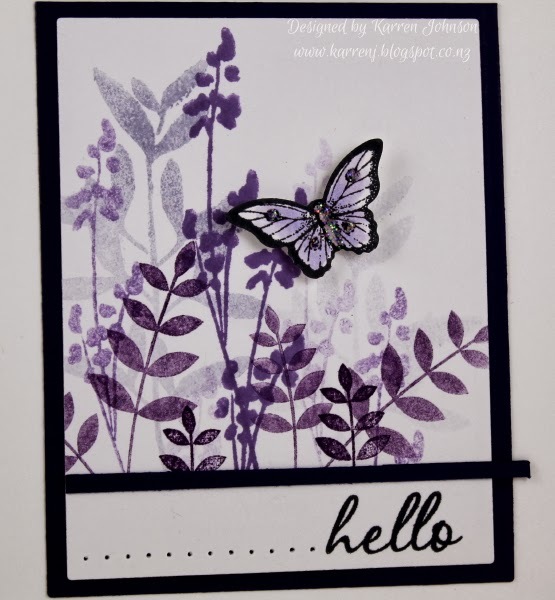 I used various foliage images and, after masking off the bottom of the panel, I stamped in several generations using Wisteria Wonder and Elegant Eggplant from SU and Dusty Concord Distress ink. 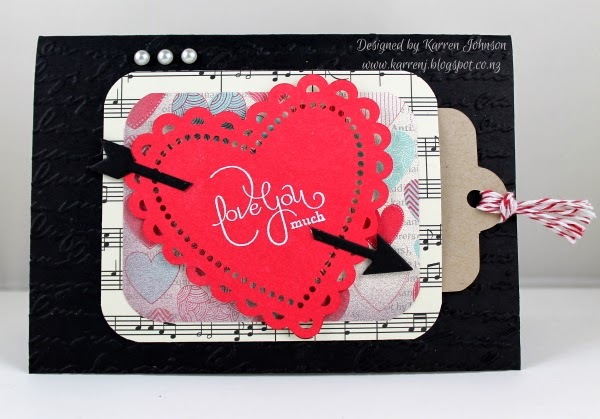 I then stamped the sentiment in Memento Tuxedo Black ink and did some paper piercing. To cover the masked edge, I placed a tiny strip of Concord Crush cardstock. I was going to snip off the overhang, but I decided I quite liked it, so it stayed! 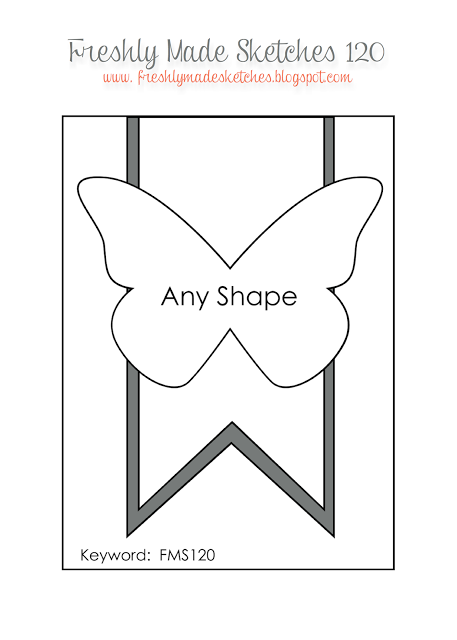 The little butterfly was stamped in black and lightly colored with Copic markers. Some Dazzling Details gave it a bit of bling. The inside is very simple, using a stamped die cut that I decided not to use on the front. 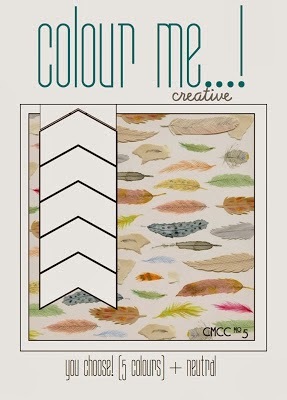 Edited to Add: This card got an Honorable Mention at Colour Me. Hi and welcome to another Freshly Made Sketch challenge. 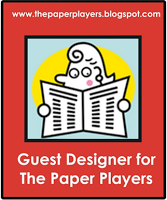 This week, it's Linda Callahan's sketch we're working with and it's a fun one. I had several ideas for this sketch but ended up going with a hot air balloon and cloud theme. For this card, I went with a fresh aqua, red and white color scheme. 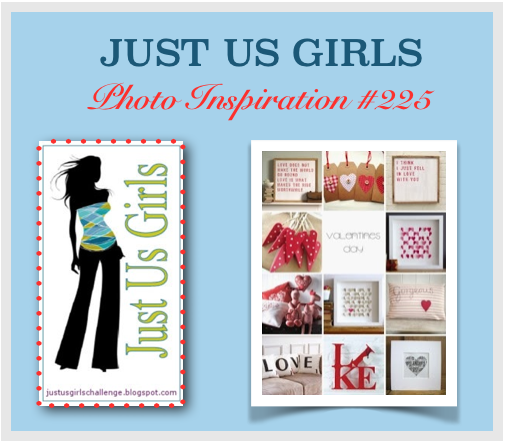 I created cut files for my images using my Silhouette then after cutting them out, I stamped the images and colored with Copics. The sentiment is from a new-to-me set called Laurels by Avery Elle. I just love the font! The curved bottom is also from a new-to-me die from Spellbinders. I hope you've checked out the rest of the Design Team's cards. They're fantastic! I'm off work this week as my boys go back to school next week after the long summer holiday and there's lots to get sorted before then. Anyway, the upside is that I get more stamping time and get to play along in some challenges I don't usually get time for. 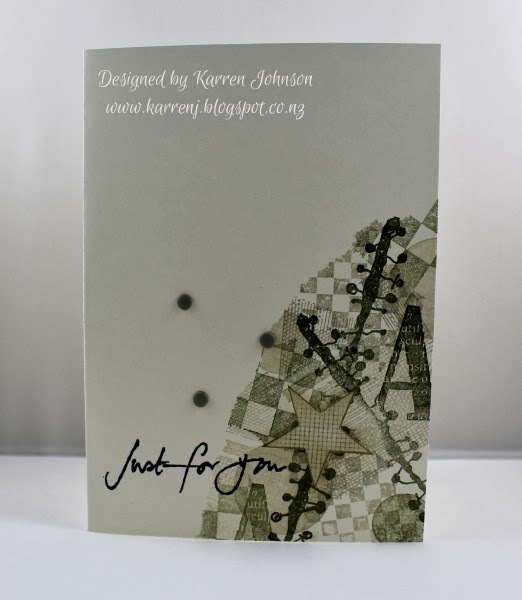 This card is for The Paper Players sketch challenge and the inspiration photo at Just Us Girls. This card is all SU apart from the tag which I cut with my Silhouette. 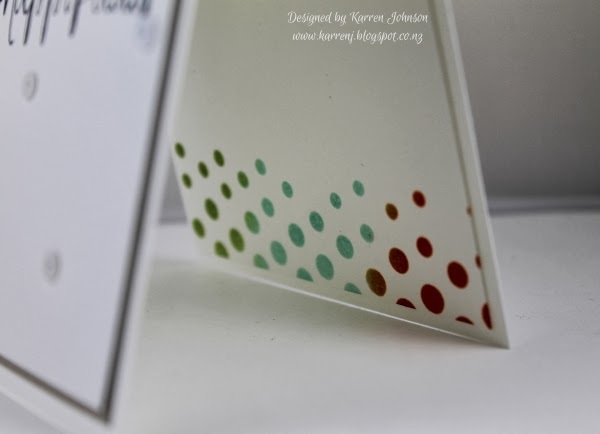 The card base is embossed with the Pretty Prints EF. I cut into some retired DSP called More Amore for the heart DSP and the laser cut heart. Pool Party and Real Red hearts were white-embossed then cut with the Hearts a Flutter framelit. I tied some Cherry Cobbler Baker's Twine around the tag and it's far enough from the red heart to not be noticeable that it's a different color. I cut two arrows from the Label Card Thinlits and cut them to appear as if it was one arrow going through the heart. It's Day 4 of the Stenciled Class at Online Card Classes, but today's card uses one of the Day 3 techniques as I had to wait for the embossing paste to dry. 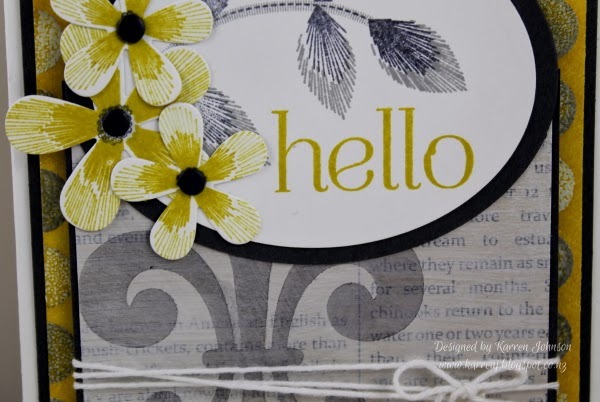 The card is finished simply with some retired More Mustard DSP, a sentiment from PTI and some twine. 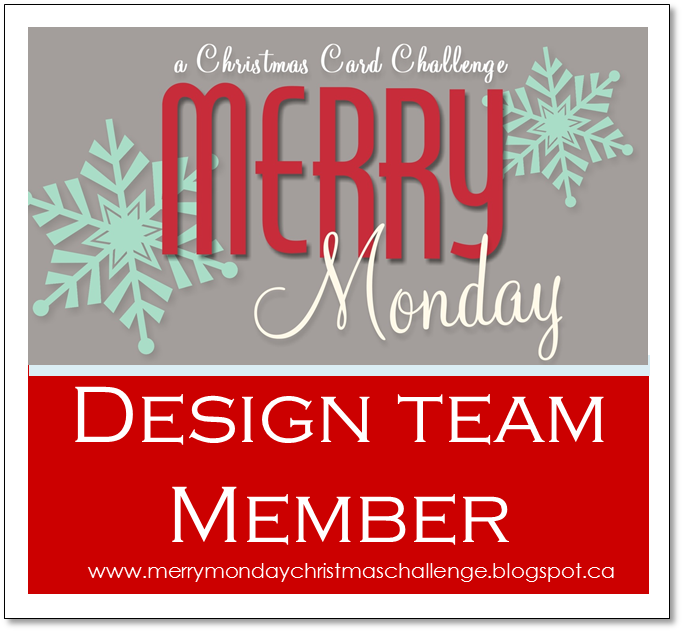 This week's challenge at Merry Monday is to use an ornament or ornaments on your Christmas card. 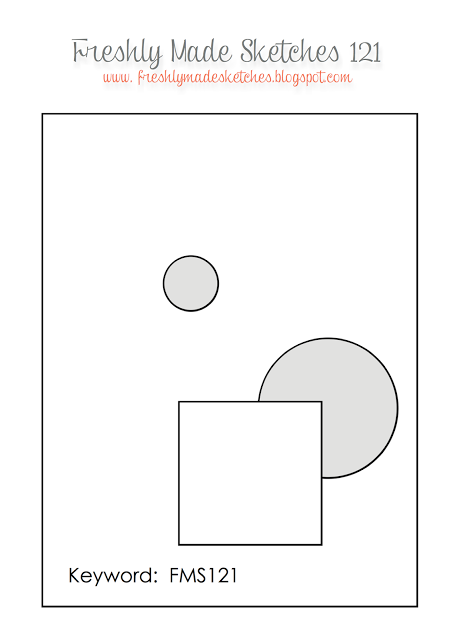 This challenge came through at a good time, because I'd just dipped my toe into the digi stamp pool and bought a few digi stamps - one of which was an ornament. And here's the card I made. As well as the digi stamp, I also bought some digi paper. 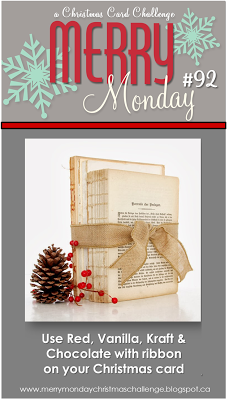 In fact, I was commenting on a Merry Monday challenge entrant, Janet Kay Bailey and I saw the paper that she used and immediately went to the link in her blog and bought pretty much the whole range! This paper has very subtle snowflakes on it. I used a sketch from Retro Sketches from a couple of months ago, which I love and will be sure to use again. 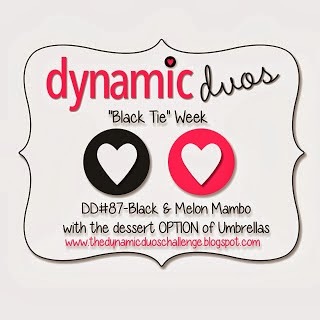 I decided to play along with the challenge colors at Dynamic Duos and its dessert option of umbrella. I was looking through my stamp catalogue looking for umbrella stamps and came across a selection of photo stamps I've had for years and years. 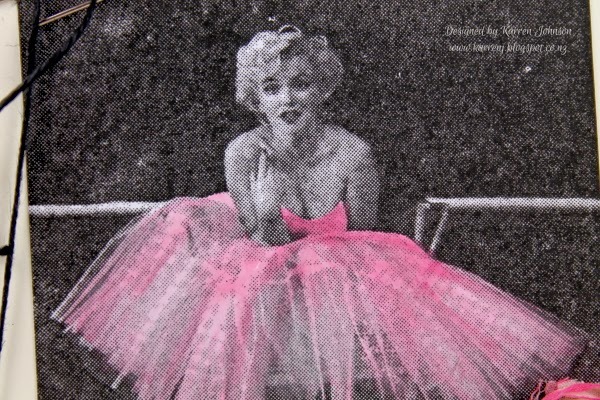 I thought this image of Marilyn would look suitably vintage/shabby chic. I love this stamp from Stampsmith - I had a quick look on their website but couldn't see this image nor a brilliant one of Audrey Hepburn that I've also got. Photo stamps aren't the easiest to stamp because they are so finely detailed but it's so worth it. This really looks like a photo cut out of an old newspaper. I lightly colored Marilyn's dress using a Melon Mambo marker and layered it onto a piece of Very Vanilla. Further texture was added using some flocked paper from Mocha Morning DSP, some torn DSP from Newsprint and Brights DSP and some colored Vanilla Trim Flowers. Some black twine and a paper clip finish off my card. Day 3 of the stencilling course and the technique I tried first was heat embossing over embossing paste. 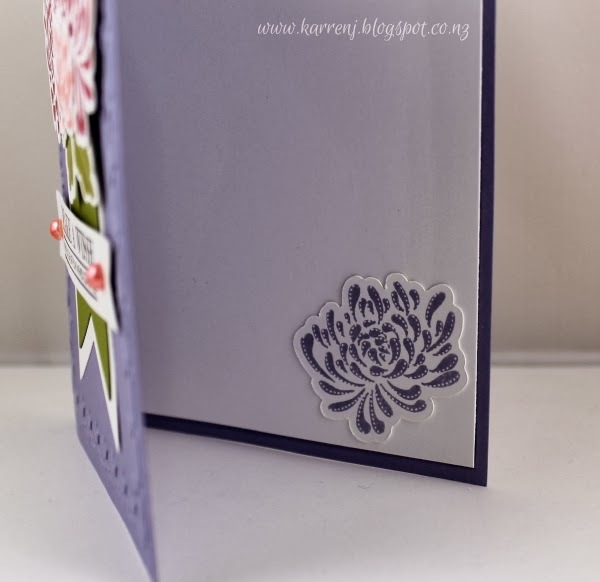 The first time I tried this, I was too frugal with the paste and it just looked like normal heat embossing, but the second time I applied a thicker layer and wow! It was even cooler to watch than normal heat embossing because the paste expanded as it heated up. 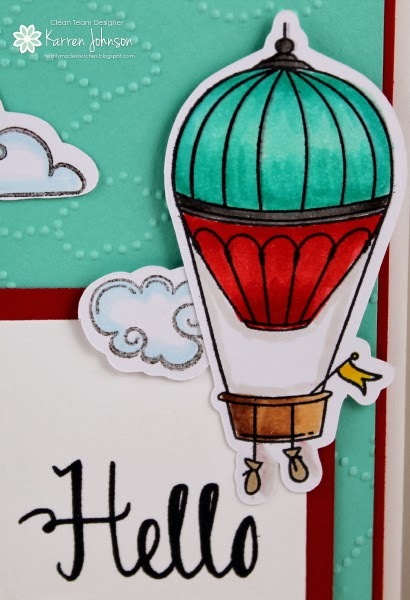 I'm entering this card into this week's CAS(E) This Sketch challenge as well as the texture challenge at The Card Concept. 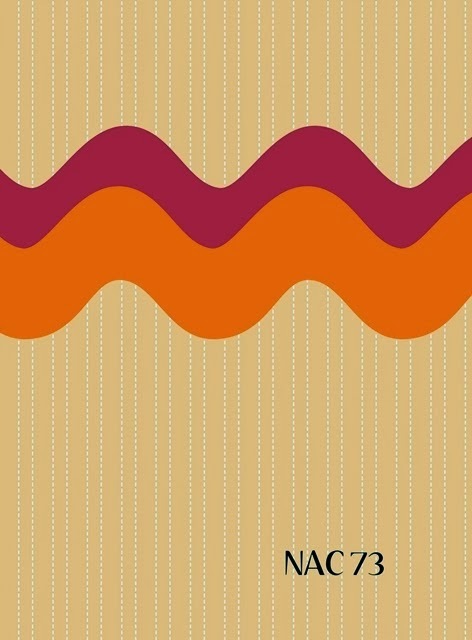 This week, I'm categorising my card as Clean & Graphic. 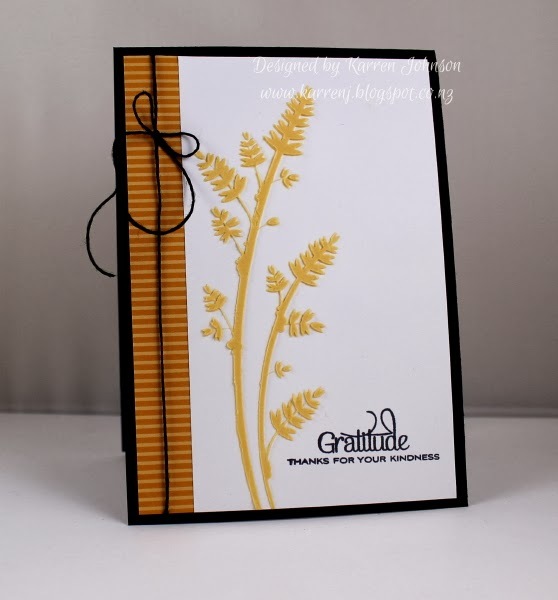 I used an old SU Decor Elements die and applied embossing paste over the top. I then sprinkled on some silver EP and heat set it. Wow, it bubbled up like liquid applique! Here's a close up and side on shot so you can see the texture and dimension. 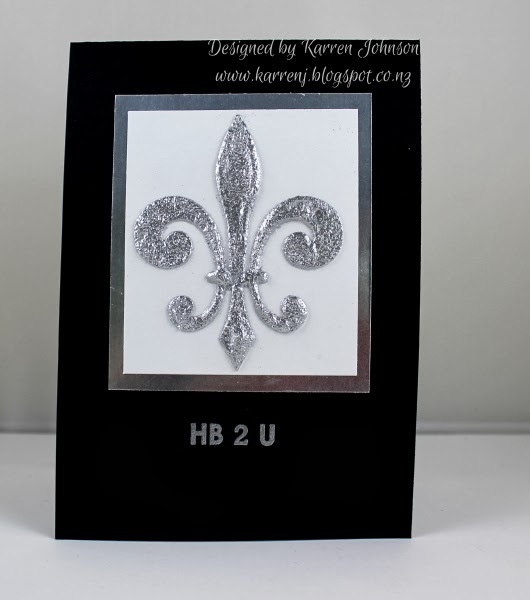 The sentiment is also silver embossed onto the black card base. I'm so glad that the Just Add Ink challenge is back up and running and I hope the DT had a great break. 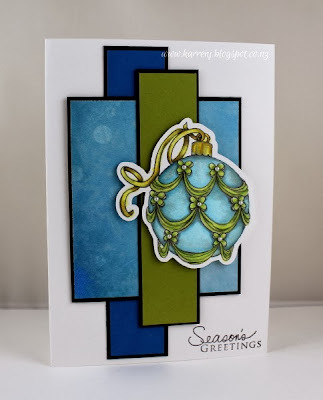 They came back with a bang - a gorgeous sketch using my favorite element - circles! 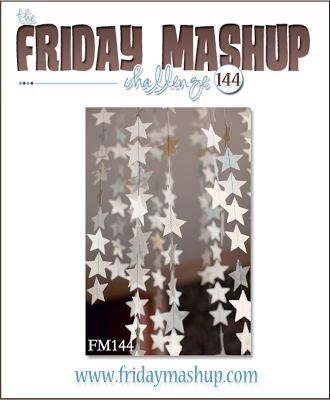 I combined that challenge with the stars challenge at Friday Mashup to come up with this card. I can see looking at the sketch that I didn't get the elements exactly right, but I hope it's close enough to pass muster. I inked up Extreme Guitar with Versarmark then Island Indigo and clear embossed it onto some DSP from World Spectacular DSP (which has stars on it). 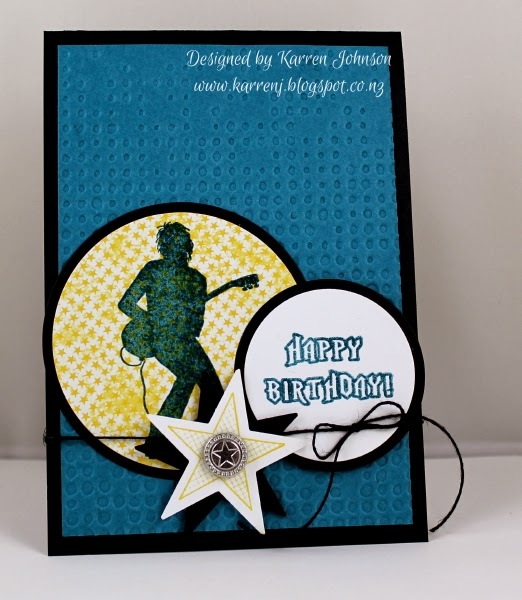 I quite liked the semi-distressed look of the embossing with some of the stars showing through. 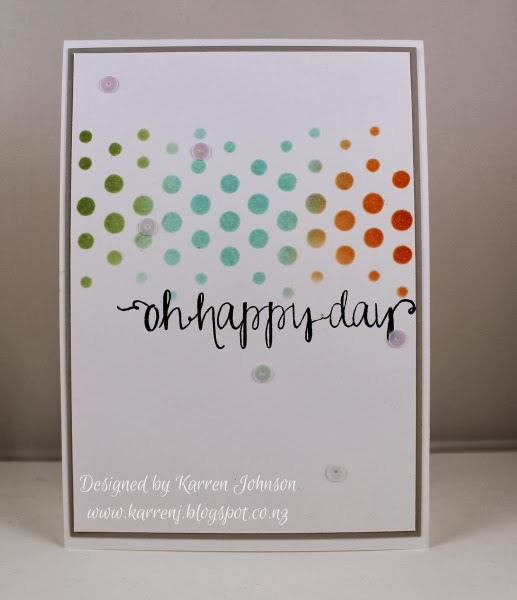 Today's card is my homework for Day 1 of the Online Card Class on Stencils. But instead of using my newly-bought stencils, I ended up cutting my own with my Silhouette. Oh, the irony! 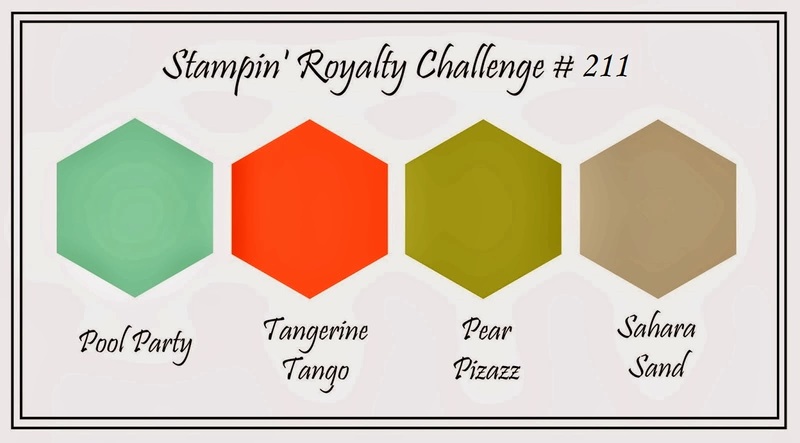 I used the colors from Stampin' Royalty's challenge and the sketch from Nacho Average Challenges - both challenges I haven't played along with for a while. 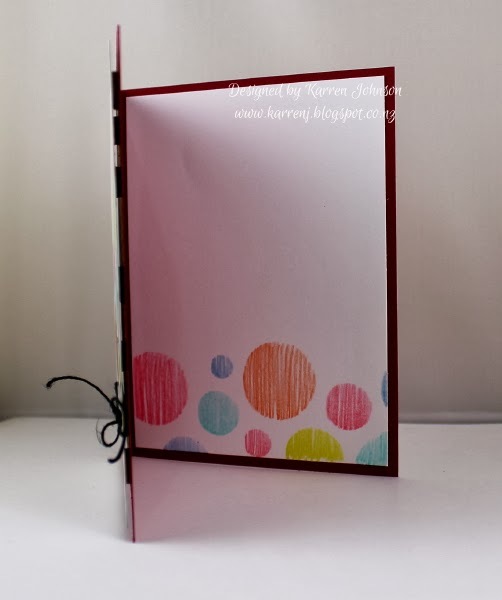 The Silhouette file was one I bought from the online library and I think it is called Random Dots. I just cut it out of some cardstock, although I do note that Silhouette have just introduced stencil material, which is pretty cool. 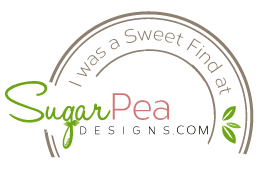 I sponged over the stencil in Tangerine Tango, Pool Party and Pear Pizzazz. 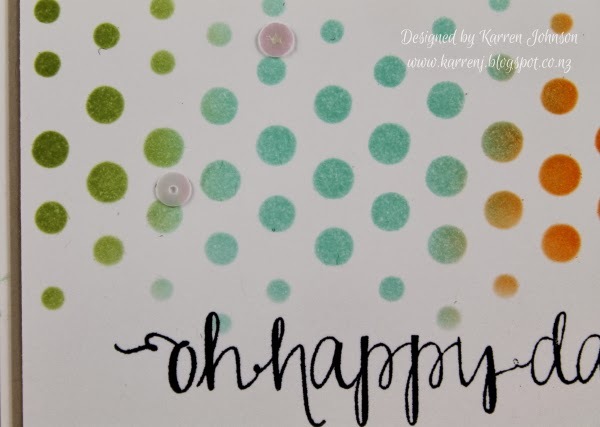 I then stamped the sentiment from Avery Elle in Memento Tuxedo Black ink. I wasn't going to put any sequins on there, but I sort of splodged the 'y' in 'day' so I had to try and cover it up LOL. 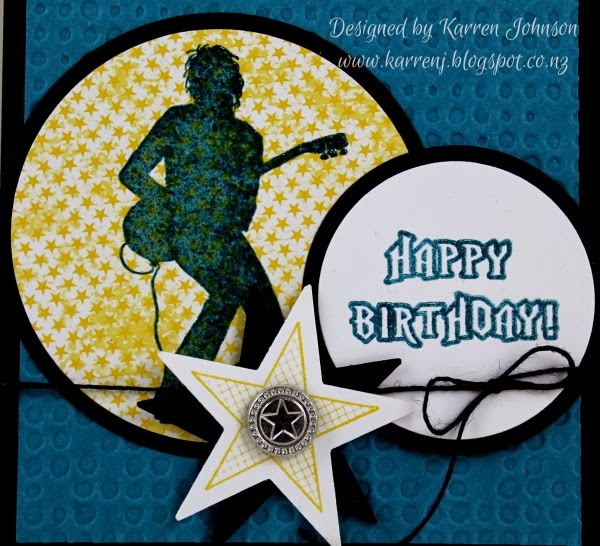 I layered that onto Sahara Sand then onto the card base. And continuing with my resolution of finishing the insides of my cards when I make them, I did some simple stencilling on the inside as well. 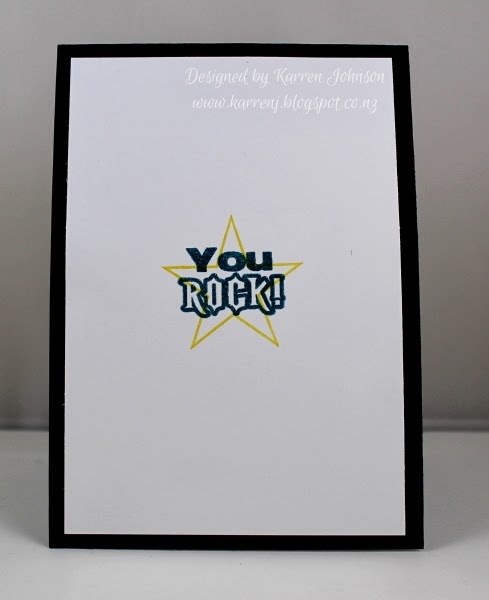 Edited to Add: This card was a top pick at Stampin' Royalty and at Nacho Average Challenges. 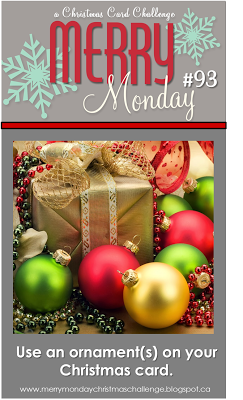 This week's sketch at Freshly Made Sketches is by Rita. You can take this sketch in many directions. 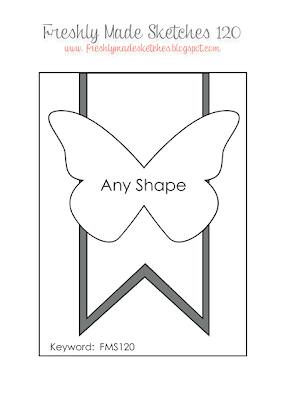 The "Any Shape" layer gives you lots of freedom, so go for it! I decided to make my "Any Shape" a bunch of flowers - mums to be precise. I think this PTI set comes with matching dies but I didn't buy the dies at the time, so today I stamped each image in black onto white cardstock and scanned it into my Silhouette software. I then traced and offset and printed out some blank templates. Now I've done the initial work, they're sitting there waiting to be cut anytime I want. Gotta love the Silhouette! I stamped my flowers in Raspberry Ripple, Crisp Cantaloupe and, believe it or not, Perfect Plum. 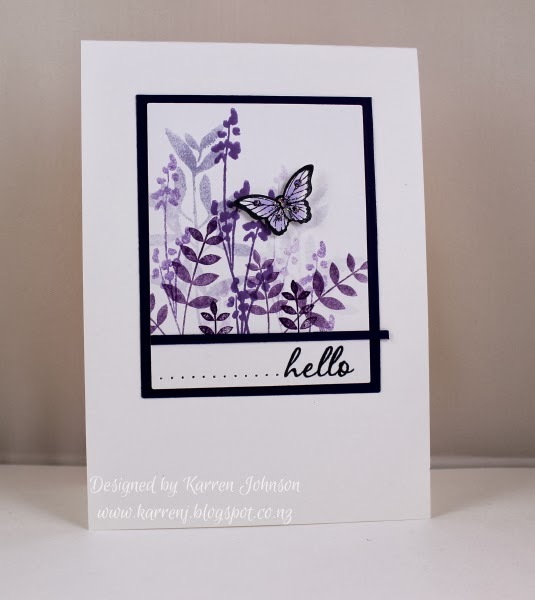 The Perfect Plum flower matched Wisteria Wonder cardstock way better than Perfect Plum, so I'm thinking that maybe I need to re-ink. 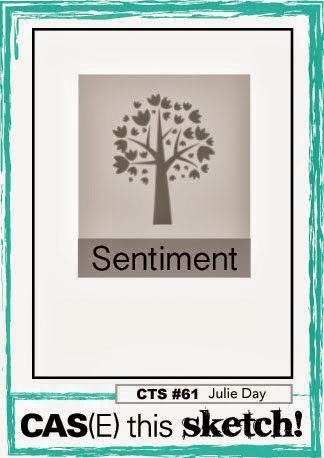 I stamped a few leaves in Old Olive and the sentiment in Versafine. The banners are cut from MFT's Fishtail Flags Stax. 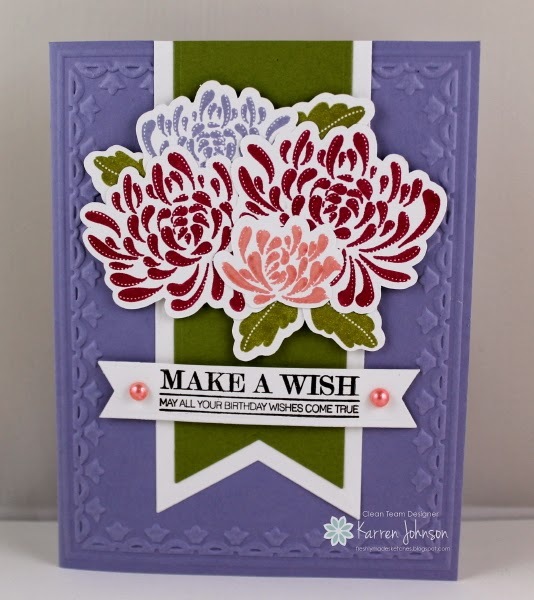 The inside of this card was very simply done this time using a leftover flower in Perfect Plum. 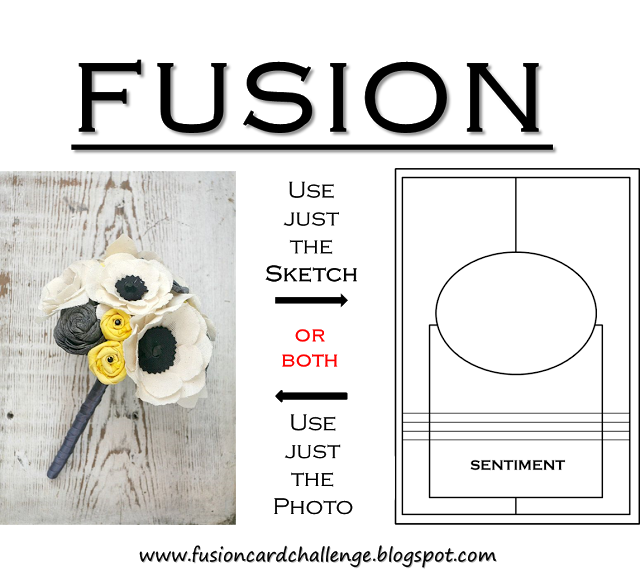 Check out the gorgeous samples from the Design Team before having a go at this sketch. Hi everyone, I hope your week is starting out well. 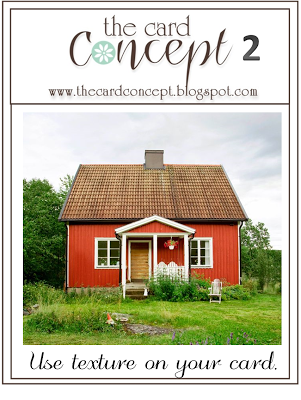 Over at Merry Monday we have a beautiful inspiration photo for you. I just love everything about this photo and chose to stick with the text theme on my card. 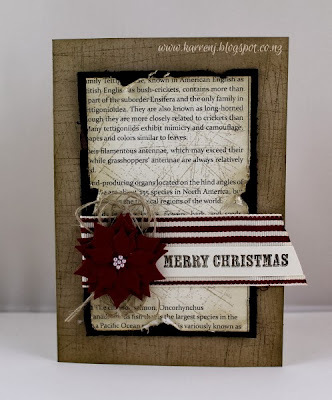 I stamped the Crumb Cake card base with both Sanded and Woodgrain background stamps before sponging the edges. The First Edition DSP was given the same treatment without using Woodgrain and this time I distressed the edges before sponging. I mounted this piece onto an Early Espresso layer which I also distressed. 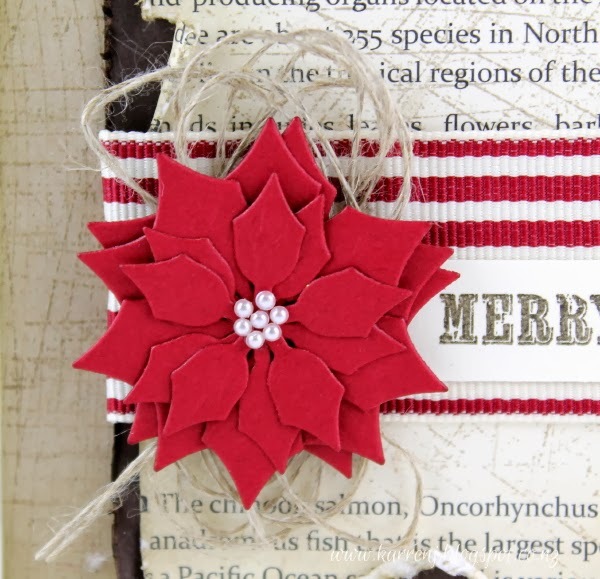 The poinsettia uses the two smallest dies in the Spellbinder poinsettia set. I cut three of the larger size and two of the smaller size and then used the smallest of the Basic Pearls for the center. I randomly placed some Linen Thread behind the poinsettia for added interest. 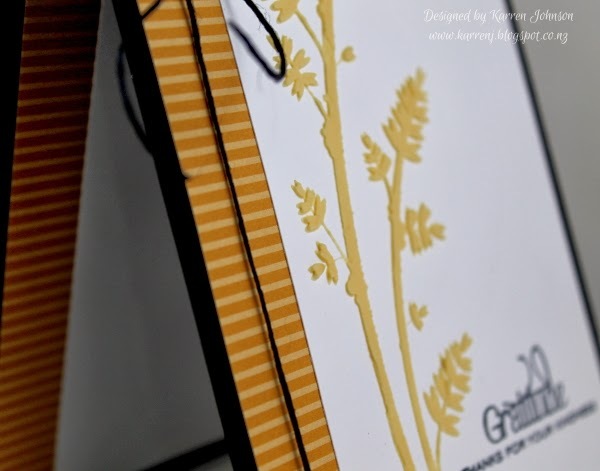 The ribbon part of the challenge is met using some Cherry Cobbler striped grosgrain which is adhered using Sticky Strip. I burned the edge to stop it fraying. The rustic and distressed sentiment is from the Peaceful Pinecones set from PTI. 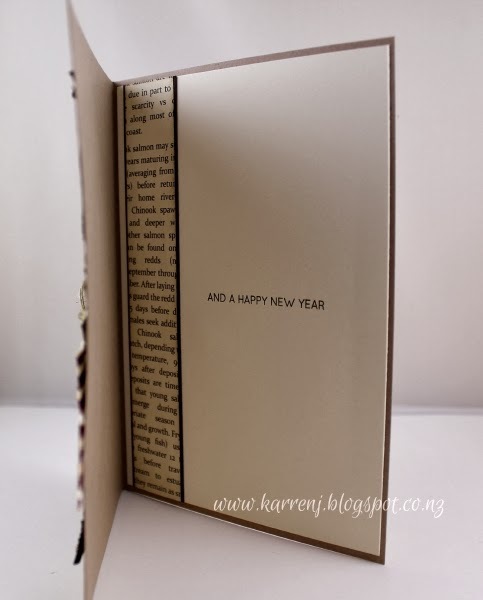 And continuing my resolution of finishing the insides of my cards when I make them, here's the very simple inside. Thanks for visiting. 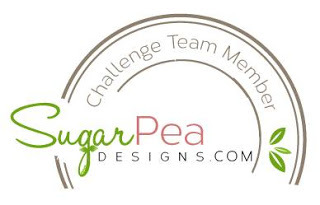 I hope you have a great week and have time to join in the challenge. 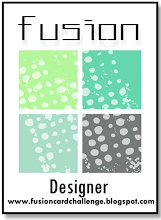 The colors at Fusion this week really appealed to me and to challenge myself I decided to add in the sketch as well. 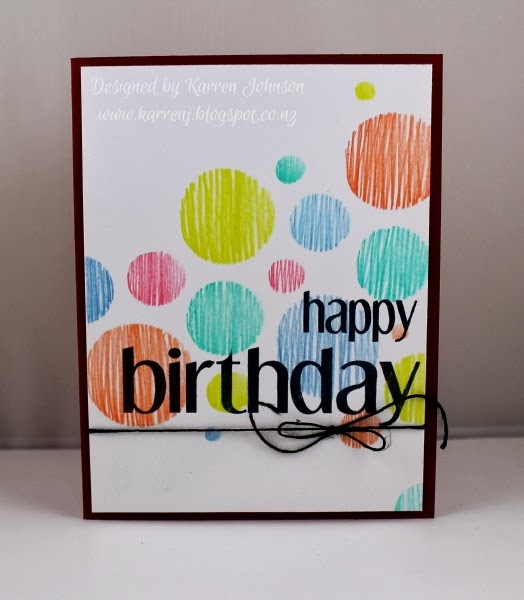 I started my card by making the dotty base. To make this I inked up the Dotted Background from SU in Versarmark then again in Smoky Slate before stamping it onto Whisper White and clear embossing it. I then sponged Summer Starfruit ink all over the panel creating an emboss resist background. The oval panel was stamped with images from Embroidered Blooms from PTI in Smoky Slate, Basic Gray and Summer Starfruit. 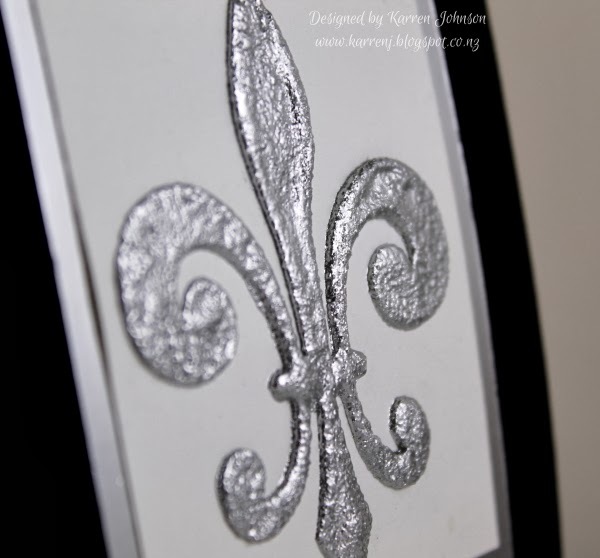 The fleur de lis panel started out as a piece of First Edition DSP which I painted with Gesso. 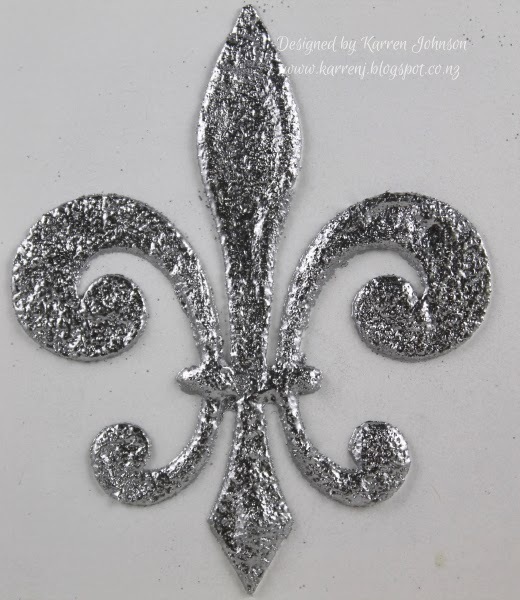 Once it was dry, I sponged over a fleur de lis stencil with Basic Gray. 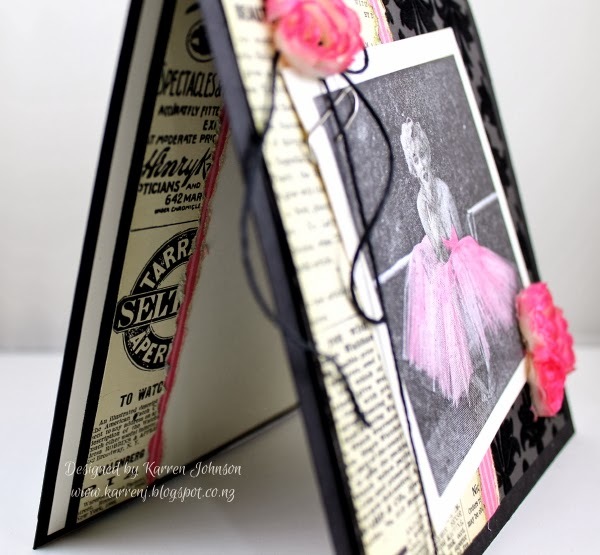 This was layered onto Basic Gray and some white baker's twine was wrapped around and tied. The flowers were die cut before being stamped with Summer Starfruit stamped off then full strength. 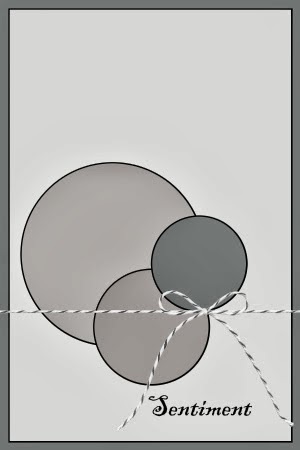 A Basic Gray Candy Dot was put in the centre of each flower. Edited to Add: This card received an Honorable Mention at Fusion.